The horned cow-goddess of love, she was also the deity of happiness, dance and music, and a protector of women. 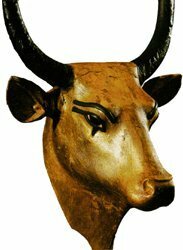 She is depicted as a cow, as a woman with the head of a cow, or as a woman with who wears the stylized cow-horns which hold in them the solar disk. Her symbols also included the papyrus reed, the snake and a rattle called a sistrum. Early in Egyptian mythology she was known has Horus' mother (later Isis assumed this role). Proof of this is seen in her name, "Hathor" which means the "house of Horus". As the mother of Horus, the queen of Egypt was identified with her. This is natural, as the queen was the mother of the Pharaoh, the living Horus. Isis was often shown with cow-horns like Hathor's on her head when the artist wanted to emphasize her role as the mother of Horus. It was said that when a child was born, Seven Hathors came to his bedside to announce his fate. The Seven Hathors were believed to know the future and the moment of death for every Egyptian. A person's destiny depended on the hour of their death and the luck of ill-fortune was connected with it. It was believed that the Hathors would exchange a prince born to ill-fortune with a more fortunate child, therefore protecting the dynasty and the nation. The Hathors were shown as a group of young women playing tambourines and wearing the disk and horns of Hathor. During Ptolemaic times (when Greeks ruled over Egypt), they were identified with the Pleiades. In the Story of Re, she was created by her father Re as "Sekhmet" as a destroyer of men, who were disobedient to him. Later Re changed his mind, but even he could not stop her from killing men. He then disguised beer as blood and when Sekhmet became drunk, she could no longer kill and was known thereafter as Hathor, a goddess of love. Her cult was centered in Dendera where she was a goddess of fertility and childbirth. In Thebes she was seen as a goddess of the dead, and the Greeks identified her with Aphrodite (their goddess of love).